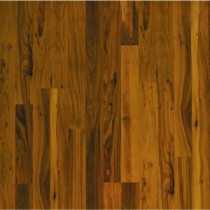 Buy online Presto Toasted Maple 8 mm Thick x 7-5/8 in. Wide x 47-5/8 in. Length Laminate Flooring (20.17 sq. ft. / case) LF000332 and leave review or share with Your friends. Presto Toasted Maple laminate flooring from Pergo features an innovative Lustergard Plus surface protector that inhibits fading and scratching, giving your new floors a hearty resilience for years to come. These planks are 7-5/8 in. wide with an all-over textured surface and square edges, supplying a real-wood look and feel in a medium Toasted Maple shade that will give any room in your house an elegant ambience. Click-joint interconnection makes installation a breeze over a dry, flat subfloor base such as wood, vinyl, ceramic tile or concrete.